This Czech baby has something like a calcium orthophosphate phosphor. Looks a lot like a halophosphor daylight fluorescent lamp at full brightness with a hint of green. Delicious I would say. The arc tube design is similar to my late 1950s Westinghouse E-H1s with the narrow pinch seals. Nice lampage. Must have some fat electrodes too I'd imagine. Don't piss your pants after seeing the color of this, LOL. Halophosphors are inefficient in converting long wave UVA into visible light, so the overall color of the lamp, should be the same as clear MV lamps, as the total amount of light added to the discharge from the phosphor is very low. There is some degree of color correction from the phosphor so it still works. Plus the phosphor apparebtly absorbs some of the mercury lines which explains the limey tint similar to /Cs. Does this run well on our gear here or did you have some European type gear for this? It sure runs fine on US H-37 and M-58 ballasts. I've lit it on both. 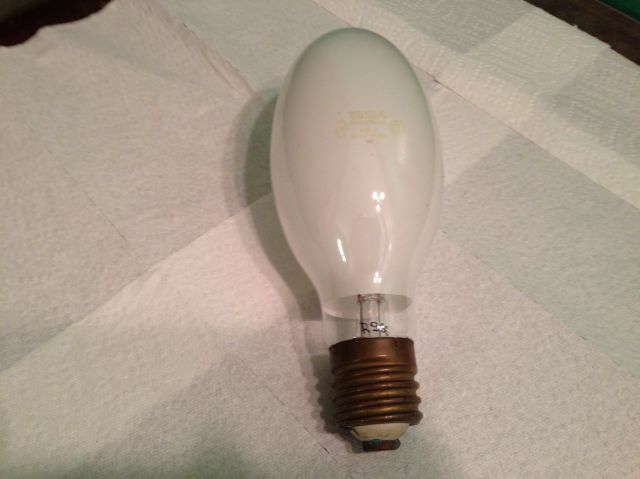 Dor, Tesla's RVL lamps were not coated with a halophosphate, but with an orthophosphate material (as indicated by Dave), so you cannot draw a direct parallel with fluorescent tubes. To be exact, the material employed in the lamp shown here is manganese-activated calcium strontium magnesium orthophosphate. The divalent manganese activation results in the fluorescence emission in the long-wave part of the spectrum (i.e. in the red), which effectively makes this lamp part of the standard white class of mercury fluorescent sources (i.e. like pre-1967 HQL, pre-1968 HPL and American /C lamps). However, differences in host material results in a broadband emission from Tesla’s orthophosphate phosphor (emission even extending into the orange part of the spectrum), whereas fluorogermanate and arsenate hosts promote the emission in much, much narrower spectral bands. This is the result of different electrostatic interactions between the host-material crystal and the dispersed activator ions, which have a strong influence on the latter's energy levels. By the way, Dave, your lamp was made in the company's Holešovice factory (also where the lamp research labs were), in northern Prague. I've not seen that Dave indicated orthophosphate. Is that one of Stan's log numbers I see on it Dave! Calcium Orthophosphate? Is the coating on these made of teeth or something? You're laughing, but haven't you noticed that teeth actually emit a fluorescent glow when illuminated with black light?